Here is a map shows territory of Russia, of Ukraine. Displayed huge city Rostov-na-Donu presented. You can find here large city Krasnodar marked. On this map city Mariupol' free download. Displayed city Stavropol' for Garmin. You can find here city Taganrog for Garmin. 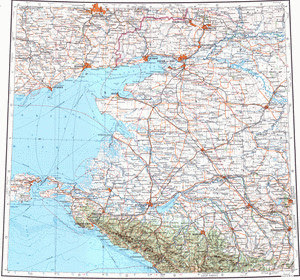 On this map city Novorossiysk marked. On this map city Shakhty for Garmin. Displayed city Armavir free download. Displayed city Novocherkassk download for free. On this map city Maykop free download. On this map city Kerch marked. You can find here city Nevinnomyssk for Garmin. You can find here city Berdyans'k download for free. On this map city Bataysk for Garmin. Displayed city Novoshakhtinsk free download. On this map city Yeysk download for free. city Azov for Garmin.